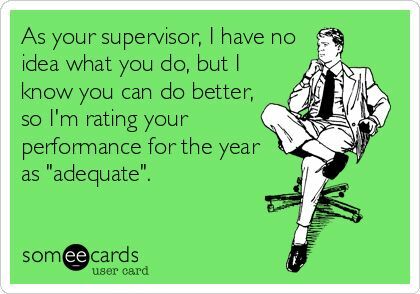 I would guess that approximately 90% of performance reviews are a complete waste of time. They are based on misguided metrics and establish goals that are often not revisited or are unattainable. In my own personal experience, I have found just that. So what can be done to remedy this? The text provides us with several options for how to complete reviews while a project is going on and once it is complete. The first suggestion which we can all apply to performance reviews throughout our careers, is to first ask the subordinate to review their own performance. This is a great way to establish a baseline and also allows the reviewer to gain insight into the reviewees perspective of the project. Another performance review best practice, which I found to be the most practical and applicable, is the 360 review. This involves soliciting feedback from several colleagues who have touched all facets of the employees responsibility and witnessed their strengths and weaknesses across the board. Even with this tactic though, there can be outliers or skewed reviews due to conflict unbeknownst to the superior or internal competition for upward mobility. Taking this all into account, as well as what we have learned in this course, I have come to the conclusion that performance reviews should be seen as an opportunity to grow professionally, improve team dynamics, and learn from constructive criticism. For the time being, they are simply a required procedural measure but I hope to be able to change that some day.